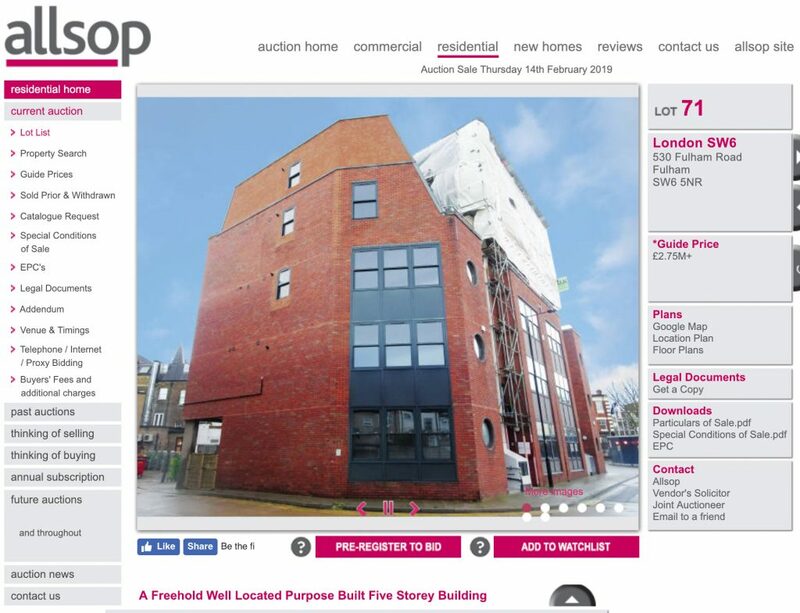 530 Fulham Road building in Allsop’s auction catalogue. Freehold purpose built five storey building. Freehold retail investment entirely let to Vodafone Limited until 2026. Freehold 3-bedroom terraced house with vacant possession. End of terrace building with spacious accommodation on two floors arranged as a self-contained 1st floor flat and ground floor office premises. Freehold mid terrace building containing 3 flats and arranged over lower ground, raised ground and two upper floors. Freehold mid terrace building arranged over lower ground, ground and three upper floors. Planning permission for redevelopment. Freehold public house investment entirely let until 2037. The property comprises the public house and three bedroom flat. Detached freehold 4-storey office block – development opportunity.